We’ve spent the last few days relaxing in Iquique, a city in northern Chile. 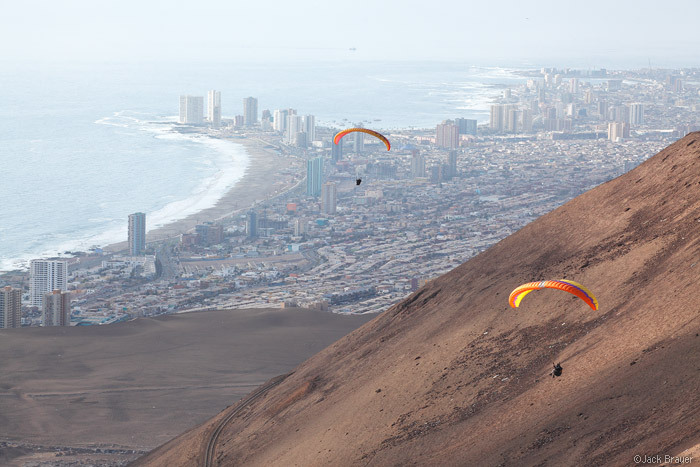 Along with it’s renowned beaches, Iquique is famous for its perfect paragliding winds, especially this time of year (spring) when the winds blow consistently off the ocean and up the enormous hills that loom above the city. We met a Chilean paraglider in our hostel who a few days before had flown 160 km down the coast from Iquique to Tocopilla! 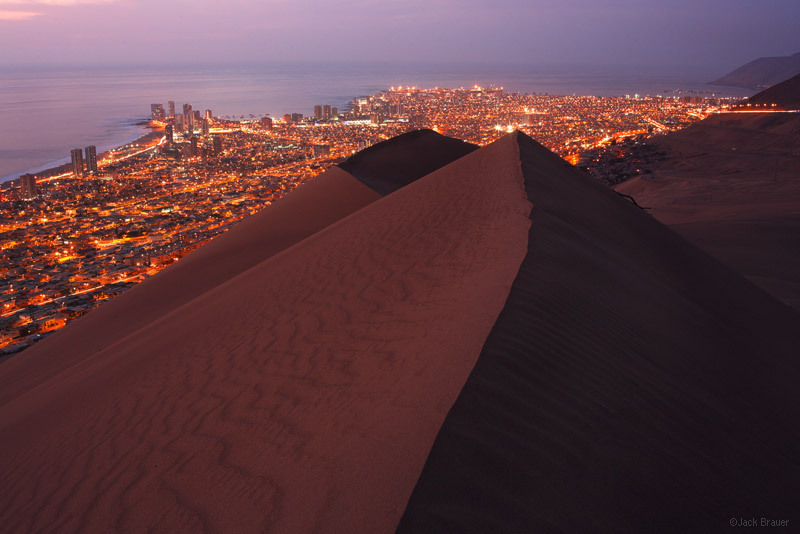 The lights of Iquique shine brilliant as seen from the top of Cerro Dragon, a huge dune that looms over the city. Driving into Iquique from the east was spectacular. You don’t really realize that you’re driving in along a high plateau until the road gets to the edge, and all of the sudden you see the city and the ocean thousands of feet directly below! If that wasn’t enough, there’s a gigantic dune called Cerro Dragon that totally dwarfs the city. Of course, we had to hike up that dune one evening for sunset! I know I’ve used the word “surreal” way too much on this blog the last few weeks in northern Chile, but how else can you describe a scene like this, with an enormous dune towering over a city?! This planet seems to hold endless surprises. Speaking of surprises, our plan to spend the next few days camping on the beaches down the coast is probably thwarted since somebody broke into our truck last night! Fortunately the vast majority of our important stuff was in our hostel room, but now we’ll have to try to replace the things we did lose and then probably just go back to Antofagasta and return the truck asap. Anyhow, once this headache passes we’ll catch a night bus back down south past Santiago to continue our journey! We’re excited to see trees again! I’m sorry to hear someone got into your truck. I hope that’s the first and last time you have to deal with THAT during your trip. Loving the photos here and on G+. Keep us posted on your backup plan! Yeah we spent most of the day yesterday sorting out that fiasco, including hours in the police station filing a tedious police report (that was an exercise in language barriers…) Though we had to spend an extra night in Iquique, we’re back on track now – the car company has a branch here and they even switched out the truck for us! We’ll have to probably spend a day in Santiago as well to replace the lost items (backpack, jacket, crampons, ice axes). It could have been much much worse! What a difference from our coastal Southern California beaches with palisades…not huge sand dunes. And bummer about your truck, but glad you had most of your stuff at the hostel. 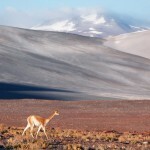 I had no idea that the South American landscape looks like it does – thanks Jack and Claudia! Thanks Kit, yeah it’s a really alien landscape here… totally barren. Surreal indeed. Love the dune shot, Jack. Seems otherworldly.